Want to know who will win today? In Today’s Dream11 Fantasy Cricket Prediction CSK vs RCB 35th T20 Match IPL 2018, we will cover toss prediction, playing 11, pitch report of Maharashtra Cricket Association Stadium, Pune. We will also cover players recent and past performance, playing condition, dream11 guru prediction, all the latest news and updates of Royal Challengers Bangalore and Chennai Super Kings, the best choice for captain and vice-captain, dream11 best team, key players, where to watch the live match of RCB vs CSK and live streaming details. All the details that we are talking about are absolutely FREE of cost. You don’t have to pay a single penny. There is a condition, you have to read the complete post. If you want to win in any fantasy leagues, we have to at least look and read each section of this post as every section contains some important information related to the match. Where Can You Watch the Live Streaming of CHE vs BLR or Channels to Watch? Who Will Win the 35th Match of IPL 2018 Between CSK vs RCB and Toss Prediction? What is the best combination of players for Dream11 in 35th Match? Date: The match will be played on 5th May 2018 (Saturday). 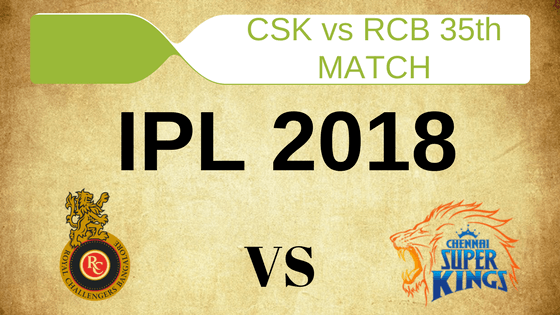 Match: Indian Premier League, RCB vs CSK, IPL 2018. Venue: Pune, Maharashtra Cricket Association Stadium. Time: 10:30 AM GMT, 04:00 PM IST. If you are going to watch the match from the stadium, then make sure to take helmets with you as the pitch of Maharashtra Cricket Association Stadium will be a batting-friendly pitch. In the previous season of IPL, the story was different, it was slow and it helped the slow bowlers but in the 11th edition of IPL, the story is totally different. The average first inning score of this ground is 129. Highest total on this ground is 158/5 in 17.5 overs by IND vs ENG. Lowest total on this ground is 101/10 in 18.5 overs by IND vs SL. Note: The scoring pattern of any ground will help you to know what could be the total a team is going to make. On Saturday, 5th May, the weather of Pune is expected to be a pleasant day. It will be a sunny day throughout the day and the sky is supposed to be clear. Cricket fans can enjoy the full match as no rain is expected. The temperature is expected to be 38-Degree Celsius and humidity to be 21%, which may rise up to 56%. Note: If you know how the weather will behave, you can make strategies according to that and can make a perfect team. The record of last five matches may make WHISTLE PODU fans happy as in last 5 matches CHE won all the five games against BLR. If we look at overall encounters, then also CSK is ahead of RCB. CHE won 13 matches and BLR won & matches. At this venue, both the teams will play their first game against each other. Note: If you have the stats of previous matches then it will help you to know which team is more dominant and has a better chance of winning. Star Sports has paid a huge amount of INR 16,347.50 Crores to get exclusive rights of IPL 2018 for live coverage for five years starting from 2018 to 2022. Star Sports has all the media rights including TV and all Digital Rights. You can watch the full match of Royal Challengers Bangalore vs Chennai Super Kings, 35th match on Star Sports. Shane Watson, MS Dhoni (c & wk), Kshitiz Sharma, Faf du Plessis, Dwayne Bravo, David Willey, N Jagadeesan, Suresh Raina, Dhruv Shorey, Shardul Thakur, Ambati Rayudu, Monu Kumar, Harbhajan Singh, Chaitanya Bishnoi, Ravindra Jadeja, Murali Vijay, Karn Sharma, Imran Tahir, Lungi Ngidi, Mark Wood, Kanishk Seth, KM Asif, Sam Billings. Virat Kohli (c), Quinton de Kock (wk), Corey Anderson, Mandeep Singh, Manan Vohra, Pavan Deshpande, Washington Sundar, Brendon McCullum, Chris Woakes, Colin de Grandhomme, Aniruddha Joshi, Tim Southee, Mohammed Siraj, Umesh Yadav, Parthiv Patel, AB de Villiers, Yuzvendra Chahal, Aniket Choudhary, Sarfaraz Khan, Navdeep Saini, Pawan Negi, Kulwant Khejroliya, Murugan Ashwin. Chennai Super Kings are at the top of the table with 12 points and Royal Challengers Bangalore are almost at the bottom with 6 points but RCB won their last match without AB de Villiers in their team and CSK lost their last game. It will be interesting to see how both the team make an adjustment to their teams. Quinton de Kock will not play today’s match as he took a flight for South Africa to attend a wedding ceremony. AB de Villiers is fit and he will replace his South African teammate. Either Parthiv Patel or Manan Vohra will open with McCullum. Parthiv was seen practising in the nets and his playing chance is high. Kohli may think of maintaining the left and right combination. Brendon McCullum, AB de Villiers, Yuzvendra Chahal, Manan Vohra/Parthiv Patel (wk), Mohammed Siraj, Virat Kohli (c), Washington Sundar, Umesh Yadav, Mandeep Singh, Tim Southee, Colin de Grandhomme. CSK played back to back games in the last couple of games and seeing this hectic schedule the management think of resting some players but this is most unlikely to happen. Shardul Thakur may replace KM Asif. Except for one change, Dhoni may play with the same playing 11 in today’s match. Faf du Plessis, MS Dhoni (C & WK), Shane Watson, KM Asif/ Shardul Thakur, Suresh Raina, Dwayne Bravo, Lungisani Ngidi, Ravindra Jadeja, Harbhajan Singh, Ambati Rayudu, Karn Sharma. Pro tips: You can choose MSD over Parthiv Patel as Dhoni is in a good form. If you are playing with multiple teams, you can keep Patel in one of your team as he has performed in the last season of IPL. Pro tips: Make a combination of the above players for multiple teams. Try to keep Kohli, AB de Villiers, Raina, and Rayudu in your teams. Pro tips: Make a combination of the above players for best teams. Pro tips: Make a combination of players from the above list. If you are playing with multiple teams you can also take players from playing 11. Pro tips: The above players are most likely to perform. You can take them as a captain and vice-captain. You can also make captains from key players list. CHE and BLR, both the teams are full of star players and power hitters. In the previous matches, it has been seen that bowling department of both the teams is weak. RCB will be more desperate to win the match. According to our astrology prediction, Royal Challengers will win today’s match. As the ground will be a batting friendly, both the teams will love to chase. The match will be played in second half of the day so there is no chance of dew. According to our astrology prediction, RCB will win the toss and they will ask CSK to bat first. Try to fill your team with inform batsmen in your team. MSD will be a good option in wicket Keeper. Try to keep less number of bowlers in your teams as both the teams are struggling in this department. Kohli, Rayudu, AB de Villiers, and Watson are must have players as they are inform players. Conclusion: This is it for Today’s Dream11 Fantasy Cricket Match Prediction of CSK vs RCB, 35th T20 Match, IPL 2018 which will be played on Saturday 5th May. You can give your valuable feedback in the comment section. Subscribe to our notification of latest updates. GOODBYE!